If you like spicy food, this is a delicious course. in a saucepan, put water to boil, then add the rice and simmer until it softens, about 20 minutes. When almost cooked, pass the pan through running cold water in order to wash the rice. Sieve the rice, then fry it a little bit in a pan with some olive oil; season with ground pepper. Keep warm until serving time. Cut the chicken breast in 1/2 inch (1 cm) wide strips. Let them marinate for 15-20 minutes in soy sauce, steak seasoning and finely grated garlic. Meanwhile, wash the vegetables, cut them into thin pieces and take the cores out where necessary. In a large skillet, pour olive oil and, when hot enough, add the vegetables. Shake the skillet or stir lightly so they don't stick to the bottom. When the carrots have softened, draw the vegetables on 1/2 of the pan. On the other half, place the marinated chicken and fry it for about 5 minutes, keeping the skillet hotter on the side with the meat. When the chicken is lightly browned, mix it with the vegetables to combine flavors. 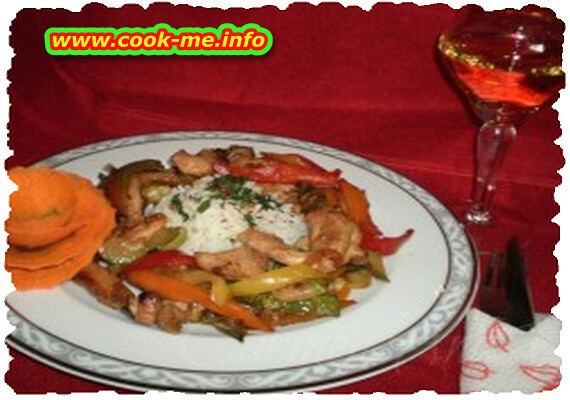 Place the rice in the middle of the plate and the vegetables chicken on the edges. Decorate with chopped mint leaves.